Jackson Godspeed is the hottest young Angel in a city filled with them. He’s days away from becoming a full Guardian, and people around the world are already competing for the chance to be watched over by him. Everyone’s obsessed with the Angels and the lucky people they protect—everyone ex- cept for Madison Montgomery. Maddy’s the one girl in Angel City who doesn’t breathlessly follow the Angels on TV and gossip blogs. When she meets Jackson, she doesn’t recog- nize him. But Jackson is instantly captivated by her, and against all odds the two fall in love. Maddy is swiftly caught up in Jackson’s scene, a world of glamour, paparazzi—and murder. A serial killer is on the loose, leaving dead Angels’ wings for the police to find on the Walk of Fame. Even the Guardians are powerless to protect themselves in the face of this threat ... and this time it’s up to Maddy to save Jackson. My Thoughts: I haven't read too many books based on Angels so when I come across one that sounds interesting, I jump right on it. I've seen more and more angel books floating around though lately. We are introduced to Jackson who is an angel. He's not just any angel, he's going to become a guardian soon. What this means is he will get a person to protect and he has to do everything in his power to protect the person. It isn't a choice, its selected by someone above him and people pay angels to protect them. Jackson is used to being in the media. In this city, Angels are popular, they are considered royalty basically. Everyone follows who the angels are and what they are up too. The person they protect also sees his/her time in the limelite. Of course Jackson also comes from a popular family, everyone knows them. Than we meet Maddy. Maddy is pretty ordinary. She lives with her uncle Kevin and helps him run his dinner. She waitresses to help him out since he can't afford to hire another waitress. She even gets up before school to help him with the morning rush. She doesn't follow the angel news at all. She couldn't care less. She doesn't see what all the hype is about. Now her best friend Gwen is the opposite. She always knows whose dating who, who each angel is, etc. One day Maddy and Jackson meet. He comes into the dinner while hiding out and he instantly feels something with Maddy. He wonders who this mysterious girl is and why she doesn't really like him. She doesn't care who he is, she wants nothing to do with him and this just makes him want her more. Of course there is more to the story, someone is killing angels. First they are ripping off their wings, than murdering them. While the stakes are high, someone is out to kill all angels and Maddy and Jackson are in danger! Immortal City was a pretty good book. There were a few parts that drag on that I had to tell myself to keep going because at times it did get slow. I really liked Jackson even though he was popular. He didn't always act like he cared. He was just himself. Now, Maddy, of course I liked her. She was so ordinary and yet she was special and didn't even know it. I also liked all the side characters, like Mitch and Gwen. They both are so opinionated. 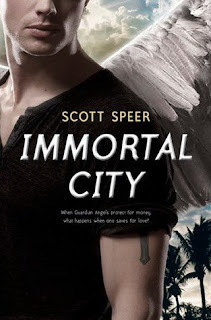 Immortal City was an enjoyable read and it was a great introduction into angels for me. Not everyone will agree probably because if you absoultely hate reading about celebrities and living life in the light you probably won't enjoy this one as much. Overall: I really enjoyed it! I loved the characters, and I loved the story. As for the bad guy, in the back of my mind, I did have my suspictions about who it was but it still played out pretty good. I'm glad to see how much Jackson and Maddy cared about each other and how it did take a while for them to like each other. They didn't automatically like each other as in some novels. All in all, I really enjoyed Immortal City. Cover: I like it enough, I love his wings behind him. And his arm has a nice tattoo. Thanks for the great review! I haven't seen this one around. I like angel books, but some are getting old, same story line. But this one sounds different! Thanks for your honest review!